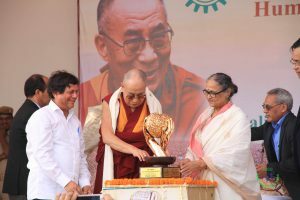 Tibetan spiritual leader and Nobel Laureate His Holiness The 14th Dalai Lama has been honored with 10th ‘KISS Humanitarian Award’ at a special function held at the Kalinga Institute of Social Sciences (KISS),Bhubaneswar on November 21, 2017. Smt. 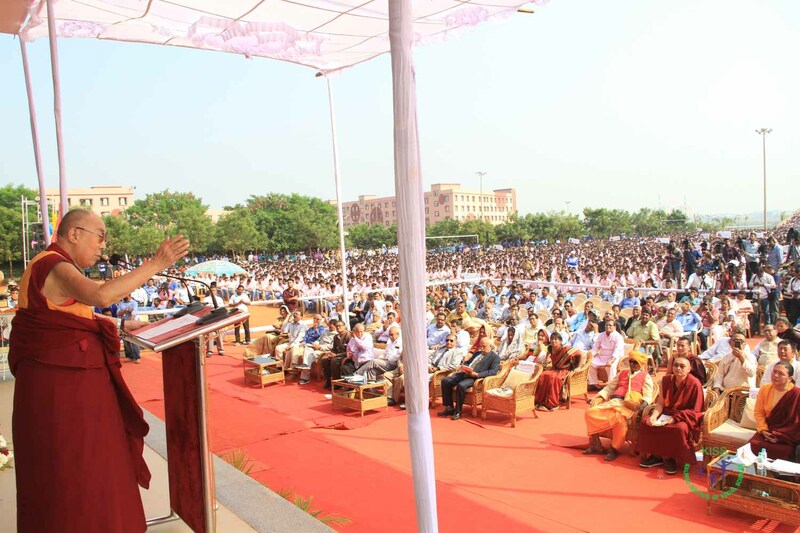 Saswati Bal, President, KIIT & KISS and Prof. Achyuta Samanta, Founder presented the award before an audience of 27,000 indigenous students of the institute and a host of dignitaries. The award citation recognized his “concern for the oppressed human beings from all over the world in need of compassion”. He is a beacon of hope, aspiration and inspiration for the millions of people across the world, it mentioned, while noting his struggles and sacrifices for the people and universal compassion. In his acceptance speech, The Dalai Lama called for making this century a century of compassion and peace. “Previous century was marred by violence – There were world wars in which atom bombs were also used. Brains of brilliant scientists were utilized for destruction. Let the 21st century be the century of compassion and peace. Peace does not come from outside, rather it comes from inside. We need to destroy our anger, aggression and jealousy. Anger and violence always bring disaster and creates a fearful atmosphere. World peace can be achieved only by inner peace”, the 1989 Nobel Peace Prize winner said. “Past is past, but future is in our hand. Your generation is the custodian of 21st century. You are the people who can create new shape of future. 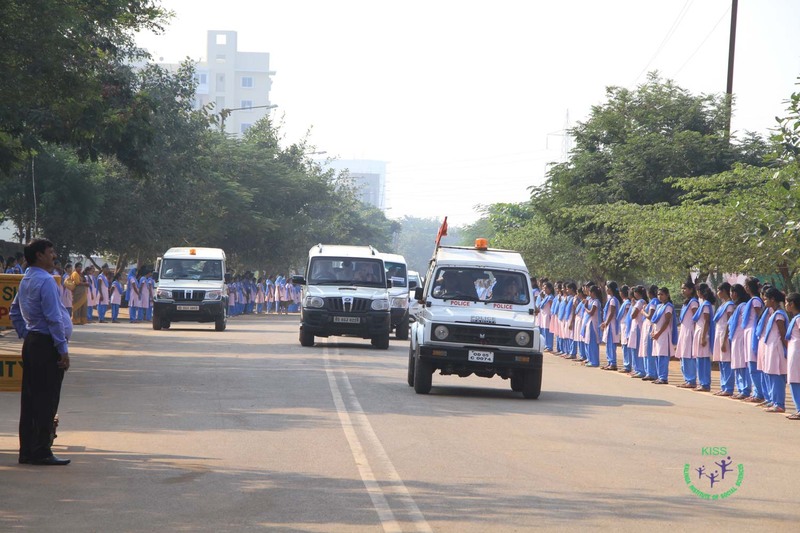 You have the opportunity and responsibility to create a new world”, he told the students. “Compassion is intrinsic in human nature. All seven billion people of the world have come from mothers. Our lives start with mothers’ love. So we all must share love. All human beings are same – mentally, physically and emotionally. Division of people on the basis of caste, color, etc. is totally wrong. Underprivileged people should not have inferiority complex. 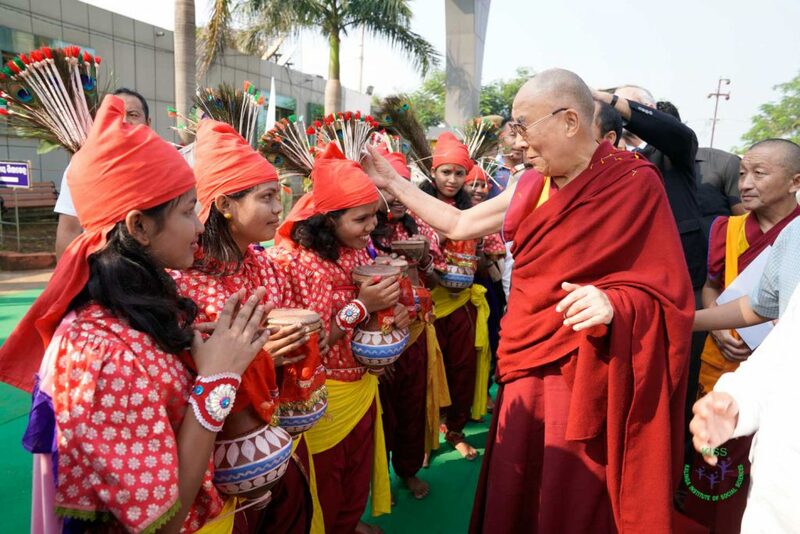 You should be self confident and work hard”, the Dalai Lama said. Deliberating on the role of education, he stated, “Existing modern education is inadequate as it focuses on material value and fame. Secular education should include moral education. Research is now going on to figure out how best to do it”. He suggested KISS to carry out experiments to include moral education. “India is the most populated democratic country and an ancient civilization. This country has produced most brilliant people, including Buddhist masters. Buddhism has come from India. Modern world lacks moral principles and knowledge to tackle our destructive emotions. Ancient Indian psychology was very advanced and still very relevant to deal with this problem. You should feel proud of your rich history, heritage and traditions”, he told the students. 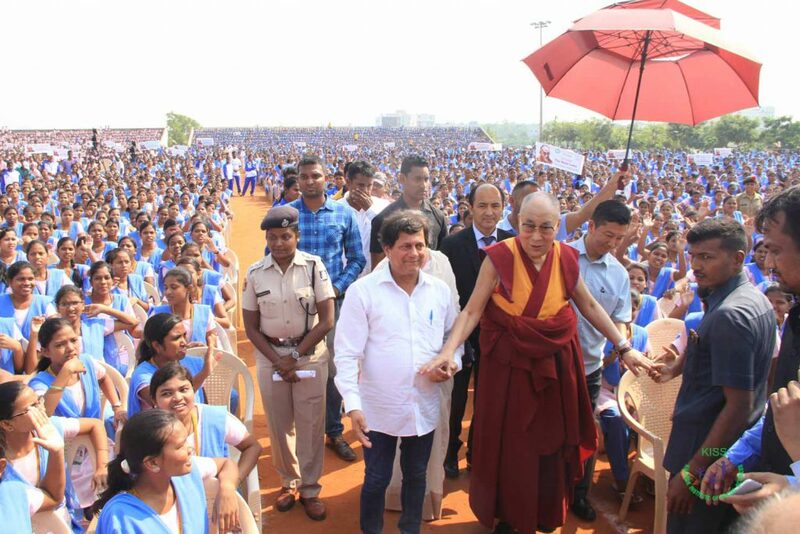 Extolling the works of Dr. Achyuta Samanta, The Dalai Lama said, “Dr. Samanta is a great humanitarian who loves people and deserves to give humanitarian award and I am expressing my gratitude in receiving this award from him”. The 14th Dalai Lama, Tenzin Gyatso, is the spiritual head of Tibetan Buddhism and recognized worldwide for his advocacy of compassion, peace and interreligious dialogue. The literal meaning of the title Dalai Lama is ‘ocean monk’ and he is regarded as “the ocean of compassion”, said Prof. Achyuta Samanta introducing the recipient in his presentation speech. The Dalai Lamas are believed to be the manifestations of Chenrezig, the Bodhisattva of Compassion, he informed. 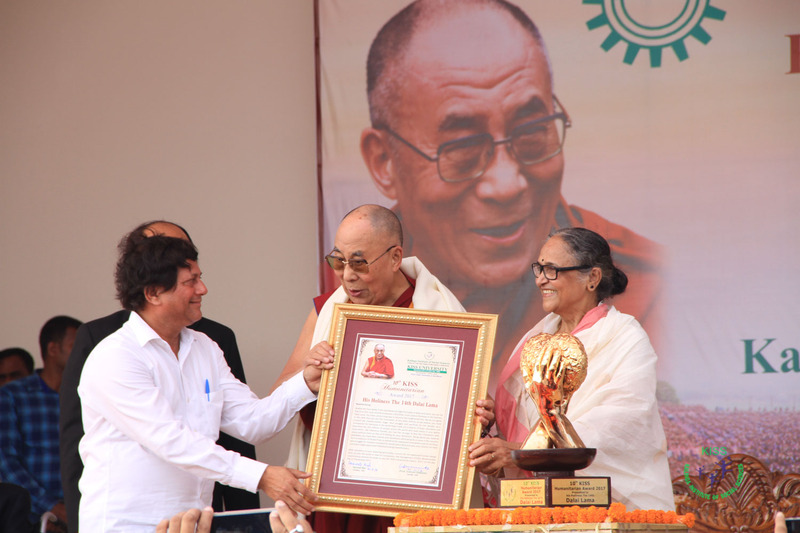 We feel fortunate to get the blessings of His Holiness and his acceptance of the award has enhanced its stature”, Prof. Samanta added. 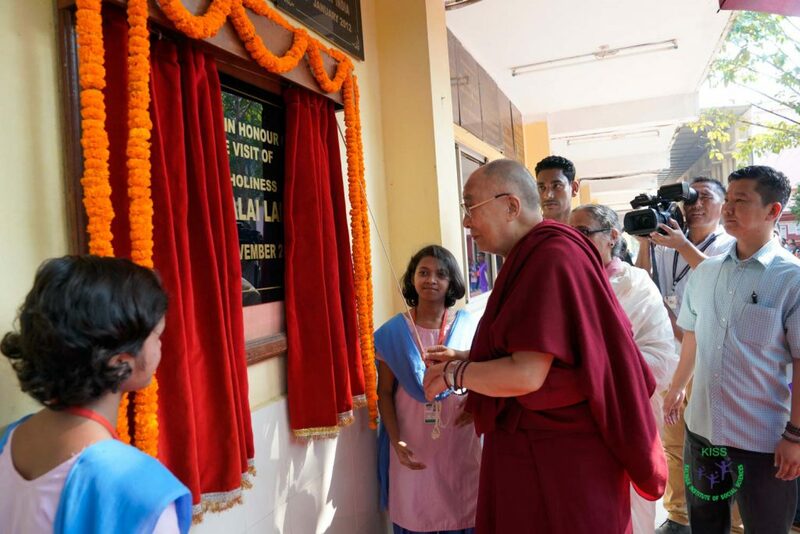 The Dalai Lama also delivered a talk at ‘KIIT Knowledge Tree’ Lecture Series at KIIT Auditorium, Campus-6. In this context, The Dalai Lama said, “There should be true inner peace. Constant anger, stress and disgust are itching our immune system as Medical Scientists say. In fact, anger and violence always bring disaster. Therefore, we should pay attention to human love and compassion as our lives start with motherly love. Compassion, Compassion and Compassion should be the universal religion”, remarked The Dalai Lama. Later, The Dalai Lama addressed thousands of Tibetan settlers from Chandragiri who had come to KIIT to seek his blessings.